A Moray man who became a champion cyclist after suffering a stroke seven years ago has completed a 500-mile ride to support a local disabled child. Callum Finlayson who served in the Queen’s Own Highlanders and then the Highlanders, was apparently fit and healthy before he suffered the stroke at the age of just 36. He later discovered he had a rare condition called neurosarcoidosis, which causes inflammation in various tissues involving the central nervous system, and was told that he would not be able to cycle again. 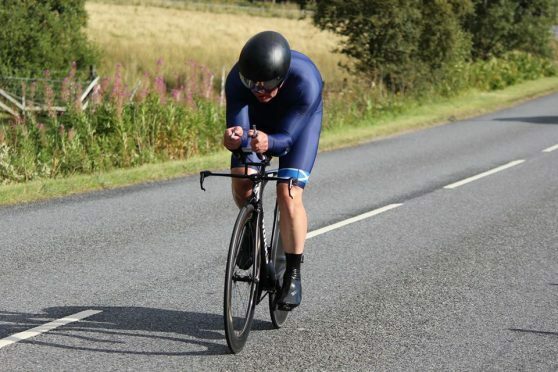 But the 43-year-old, of Forres, proved the doctors wrong and last year became Scotland’s time trial champion. Mr Finlayson also holds the third fastest time for 100 miles in Scotland after completing the distance in three hours and 48 minutes. A couple of years ago, Mr Finlayson set up a charity called PedalStrokes to help people with stroke and sarcoidosis. He said: “I was told I would never be able to get on my bike again, but I did, and I lived to tell the tale and achieve my dream – to win the Scottish Championship. And his latest project was to raise at least £2,000 to buy a new bike for nine-year-old Charlie Skivington, of Forres. Mr Finlayson said Charlie suffered from a form of cerebral palsy called spastic diplegia. “This means he can’t walk, but he has strength in his legs so he can cycle and all his freedom comes from being on his trike,” he said. “His trike gives him the stability as he wouldn’t be able to balance a normal bike, but he has outgrown his present one. Mr Finlayson cycled the North Coast 500 – a 516-mile scenic route around the north coast of Scotland starting and ending at Inverness Castle – to raise funds for a new one. He completed the route in four days, with the support of his Army pals, Alan Clarke and Davie Raeburn, both also 43 and from Forres. He said: “It was pretty tough but we managed to get around. “I was shocked how much climbing was involved and ended up cycling about 200 miles into a head wind from Durness to Wick, then Wick to Inverness. The ride raised around £3,000, which means Charlie can choose the bike he wants. It will then be converted into a trike by a specialist company. Mr Finlayson thanked his friends for providing back up, and High Road Campers, of Elgin, for providing a support vehicle and Mosset Tavern in Forres for sponsoring the trip. To donate, visit www.justgiving.com and search for PedalStrokes.